In this post we discuss Travel in Venezuela, the myths and what we really experienced traveling here for a month. What do things cost and what was our experience regarding crime, corruption, free petrol, empty shops and annoying police. We discuss some tourist attractions in Venezuela and some awesome activities we did traveling around this extraordinary country. Venezuela must be one of the most unique countries I have ever been to. Since so few people travel here, most of what we heard, from its beauty to its dangerous reputation is a combination of myth and mystery. 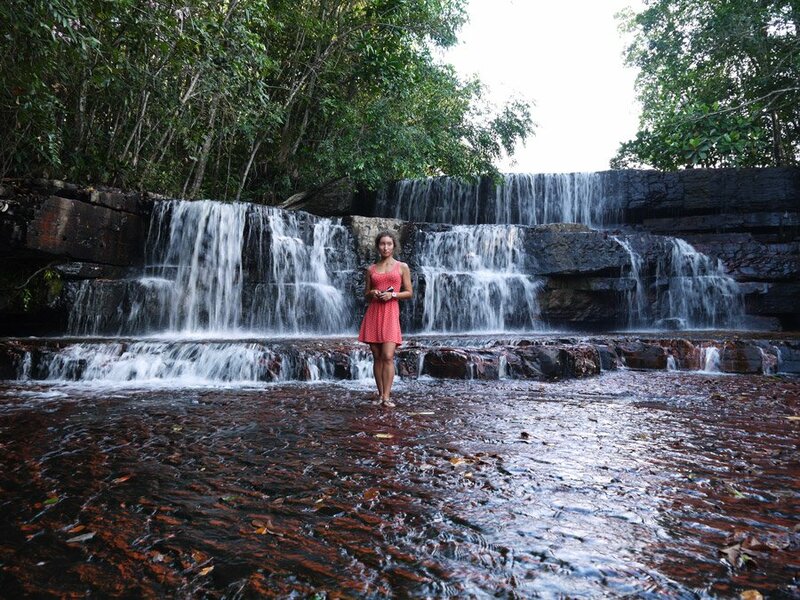 It is a country that has never been on my travel radar; Alya however has been talking about visiting the amazing mountains of Roraima for a while. When we started to investigate heard many terrible stories about the dangers of traveling to Venezuela. It seemed like walking in the street was risking your life and that having foreign currency was a crime. Stories of police searching you and relieving you of “illegal” cash if you had US dollars. We met a fellow South African traveler that told us about an extremely beautiful country with super friendly people. We traveled to Venezuela from Manaus in Brazil and paranoia made us leave most of our valuables in Manaus. It sounded like we were heading to a war zone! If we took laptops we would have stayed in the country working for a while and if we had more money on us we would have gone to all the main attractions in the country. Since we only planned to do the Roraima trek and go back to Brazil we only had about $180 USD each, this lasted a month! Since it is to expensive to draw money or pay by card this was all the money we had as long as we stayed in the country. Our average budget was $6 a day each all inclusive. 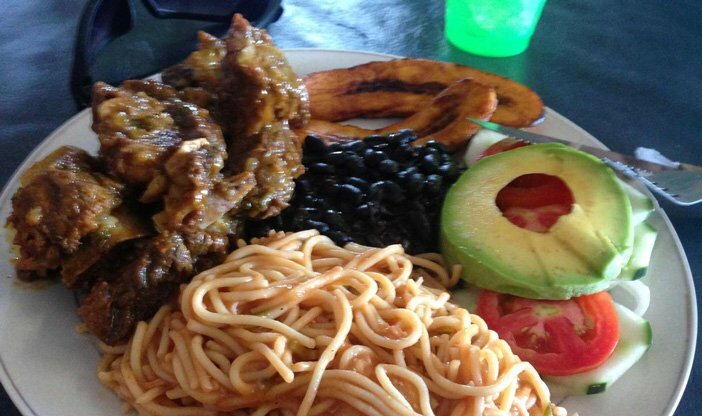 For this we were staying in private rooms, eating at a restaurants or street food 3 meals a day. Sometimes we even ate pizza, drank a cocktail or went to a fancy coffee shop. Here we did not really cook ourselves. Restaurants/street food is cheap and there is not much to buy in the supermarkets. Waterfall in Canaima National Park on the Gran Sabana Venezuela. When discussing traveling to Venezuela the two most popular topics are currency and crime. The socialist policies of Venezuela led to a spectacular collapse of the local currency. In 2017, the official exchange rate was about $1=B10, on the black market you could however buy B3000 with $1 (2017)! This means that a Coke will only cost 5c at the black market rate, but you will pay $33 for the same Coke at the official exchange rate! If you bring cash it is an unbelievably cheap country to travel. If however you draw money at an ATM or pay by credit card at the official rate it is maybe the most expensive country in the world. It is a great country to travel for budget travelers with a couple of dollars in your wallet, but it is a country with big economic problems. 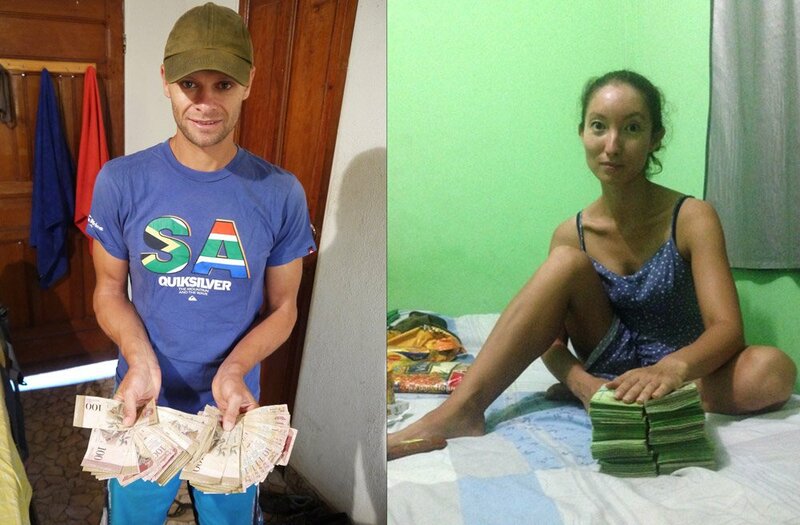 Local people are still getting the same salaries in Bolivars as before the currency collapse. This meant the minimum wage was now $11 per month and a doctor I met was earning a monthly salary of $30! This does not really make sense since I paid a shoemaker $2 to fix my trekking shoes. 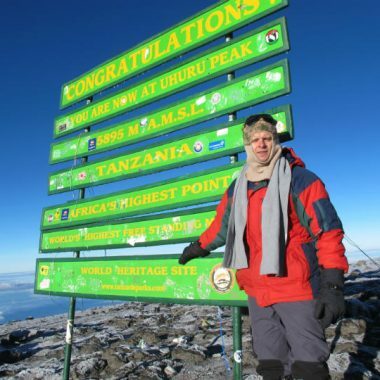 Since he fixed at least ten pairs per day he was earning much more than a medical doctor! The only disadvantage of the exchange rate for travelers is that you have to bring all the cash for your whole stay with you when you enter Venezuela. Criminals know this, making you an obvious target. Some interesting prices in Venezuela. This was in 2015, with the falling currency everything should be less than half these prices in 2017. Unfortunately we found the rumors about empty supermarket shelves to be true. When they do receive subsidized products, e.g. chicken or toilet paper people were waiting for hours outside supermarkets. Customer service was terrible and somehow whatever you are looking for always happens to be out of stock. How not a single pharmacy in a city can stock tampons or the only McDonald’s in the country can be without fries will always be a mystery to me. Bus tickets can not be bought a day in advance. I had to get up at 5 am and walk 3km to the bus station to ensure I get tickets for the evening’s overnight bus. The police in Venezuela caused us some stress. 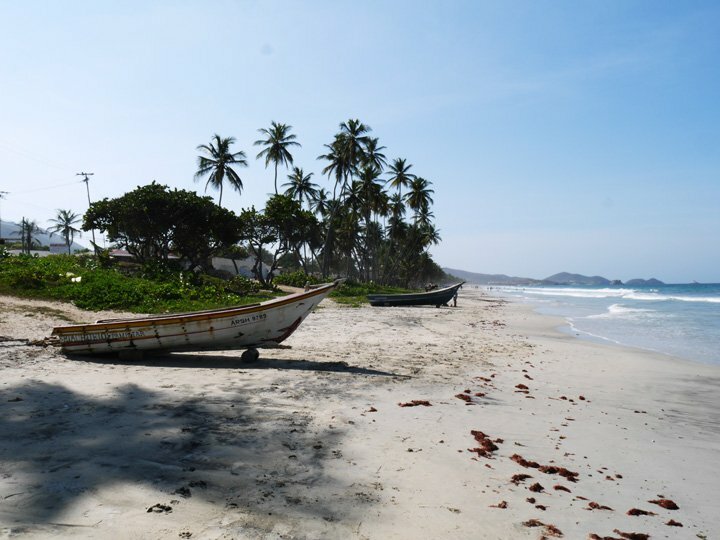 We met more than one traveler that got robbed by Venezuela’s law keepers. There are constant road blocks and we had to get out of the bus up to five times, unpacking your entire luggage, during a 12 hour journey, in the middle of the night! We were never robbed or very worried, but I have heard some horror stories. I would recommend hiding your dollars (Alya stitched our extra dollars in her shoe). Is Venezuela Safe to travel? Statistics show that Venezuela is a very dangerous place. We were never victims of crime and never felt serious threat. We did however avoid big cities as far as possible. Some of our friends traveled through the whole country for months. They were mostly hitchhiking and Couch Surfing and never had any crime problems. Being streetwise and careful here is a must. I don’t think you need to travel with a guide or police protection, but just look around and think a little bit. 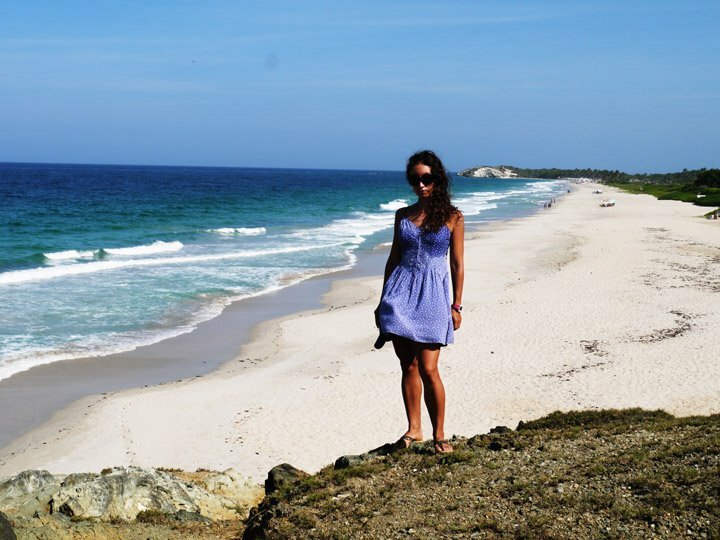 We like to hear people that has been to a place’s opinion, otherwise it is just rumours, see what a fellow blogger says about safety traveling in Venezuela after three months in the country. The town is the main entry point from Brazil. It is the best place to organize hikes to mount Roraima and the beautiful Gran Sabana area surrounding the town. We stayed in Michelle’s guesthouse, most tourists end up here, making it a great place to meet people. 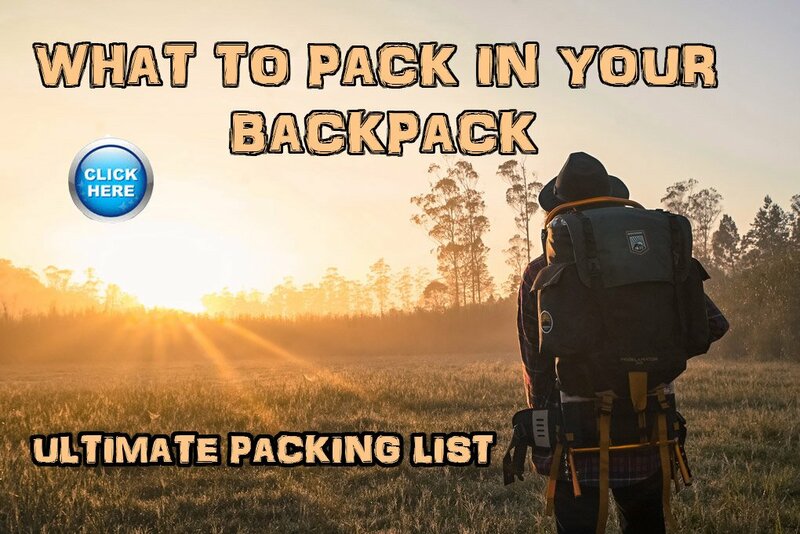 This is important since you need to be at least four people to hike Roraima. We paid B1500 ($2.50) per night for a double room with on suite bathroom, not luxury, but a good deal. For me the highlights of the town was the food. A coffee shop that sold a mean double espresso for B150 ($0.35), a good Italian pizza place (medium pizza B700) and cocktails at Backpacker’s tours next to Michelle’s (B300/$0.42). The dollar exchange rate is not good in Santa Elena, but since it is on the border with Brazil the exchange rate for Brazilian Reales to Venezuelan Bolivars is good here. We got stuck in Santa Elena for a week, waiting for two more people to complete a Roraima group. On a budget of $5 a day waiting is cheap, but takes some patience. Santa Elena is on the border with Brazil and petrol only cost B5 ($0.01) for a full tank. 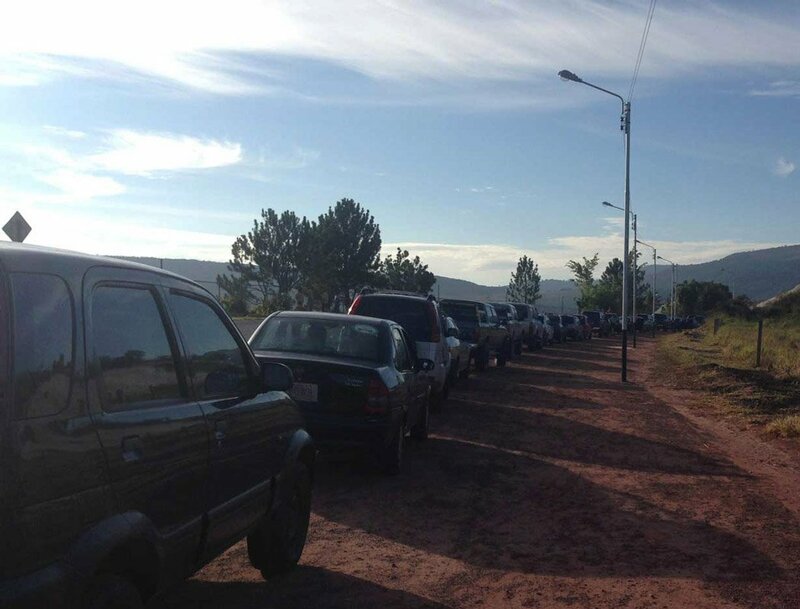 Many people fill their cars and smuggle the petrol over the border, selling it in Brazil. Santa Elena, 6am and cars lining up for kilometers waiting for the petrol station to open, travel Venezuela. 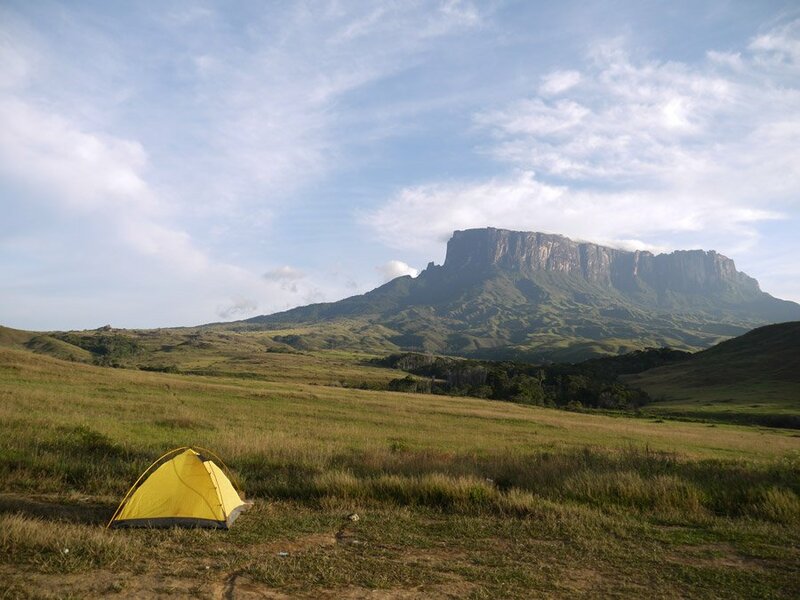 The Gran Sabana is a beautiful area of wide open grasslands with tepuis (Table Mountains) all over the horizon. It is huge, about the size of Belgium. The whole area is protected in the Canaima National Park. Driving around the impressive plains there are waterfalls, rivers and swimming holes to visit. These structures scattered around the area sits atop one of the world’s oldest geological formations. The cheapest full day tours we saw was with Backpacker’s tours for B8000 ($11.50) in a full Jeep. We were three people and paid a taxi driver we met at Michelle’s B6500 ($9) each to take us to the main waterfalls and sights that we could drive to within one day. We hired a taxi for a day to explore the Gran Sabana. 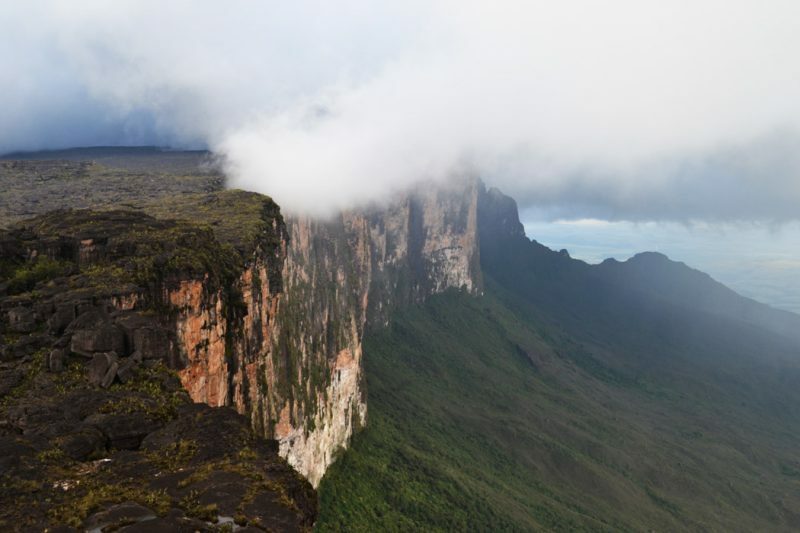 At around 2,800 m this is the highest of the Table Mountains in the Gran Sabana. It is the most accessible for hiking and this unreal mountain is why we came to Venezuela. This unique landscape and strange rock formations feels partially prehistoric, partially fairyland. It is compulsory to have a guide when hiking Roraima. There are several agencies in Santa Elena that offer all-inclusive trekking tours of mount Roraima. Prices range between B63 000-80 000 ($90 -$115) per person for 5 days. Hiking Mount Roraima with a guide. We do not like organized tours and were lucky to meet Luiz (Vago L Suarez) through an Irish friend at Michelle’s hostel. He is an independent operator/guide, Luiz assisted us to rent all equipment and shop for food. Together with Martin and Jana, a Czech/Slovak couple we were a group of four and the trek cost us B28 000/$40 per person, all-inclusive for six days. We had a very good deal only having a guide and as per usual we carried our own stuff, cooked ourselves and pitched our own tents. We started getting some serious saltwater withdrawal symptoms. After hearing stories about idyllic tropical islands and perfect white beaches we decided to head to Isla Margarita in the Caribbean Sea. It was not the perfection we were hoping for, but the water was warm and clear (26C), it was awesome to run on the beach every night and we were staying in a very fancy guesthouse by our standards for $4 a day! The Venetur is a five star hotel on the beach and the honeymoon suite went for B8800 $12.70/R195) per night! We took an overnight bus from Santa Elena to Ciudad Bolivar for B1300 ($1.85/R28) connecting with a bus to Puerto La Cruz B750 ($1/R15) from Puerto La Cruz we took a very fancy ferry for 4 hours to Porlamar on Margarita Island for B750 ($1/R15) where we spent our first night (hotel double room B1900/$2.70/R42). 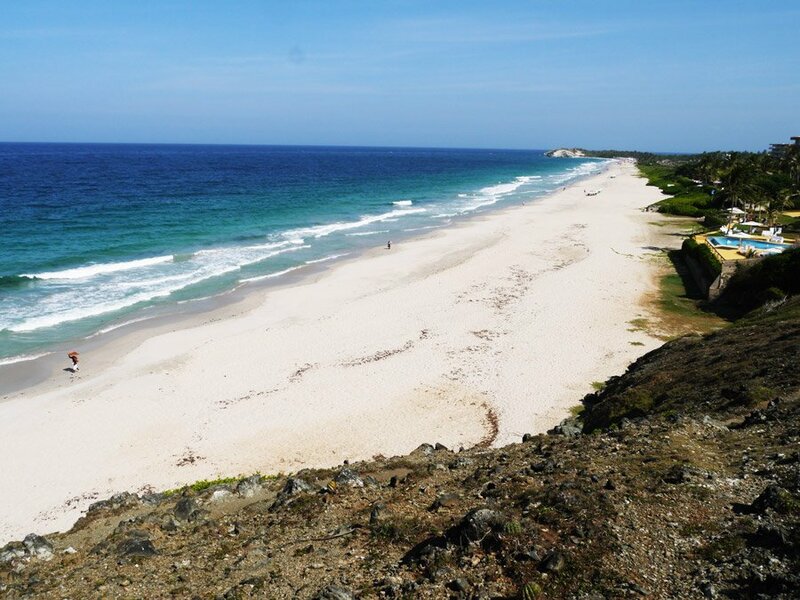 We went to Playa El Agua, the most popular beach and surfing destination on the island and stayed in El Poso Guesthouse close to the beach. It was nice to be the only guests and we ended up staying here for a week. We had a beautiful room, satellite tv, swimming pool and a nice kitchen, for $4 a night it was a great deal. The beach is nice and we went for a 10km run on the beach every night. It was not a beautiful area. Being a bit dilapidated with a lot of broken down buildings. The only restaurants or shops on the beachfront is a Chinese restaurant and a Subway franchise, with probably the best priced Subway sandwiches in the world at B400 ($0.57/R8.00), pity they never had cheese. As for surfing, it was a beach break that closes out almost immediately so not really surfable. There were some softboards to rent on the beach. Playa Parguito, the beach the beach next to Playa El Agua is a beautiful beach, it was empty and very nice for swimming. El Poso Guesthouse Chilling at our guesthouse listening to the Springboks winning a world cup match! The wifi at the guesthouse was good and I spent a lot of time in a hammock next to the pool listening to the rugby world cup games being streamed on radio through my phone. is the highest waterfall in the world and the main reason many people come to Venezuela. Ciudad Bolivar is a good place to organize the trip from, the best price we could find was in Santa Elena with Turistico Alvarez (Francisco Alvarez works with Michelle’s guesthouse), they also have an office in Ciudad Bolivar at the bus terminal. He offered B120 000 ($170) for the 3 day tour including flights, canoe rides, accommodation and all meals, we would have to make our way to Ciudad Bolivar by bus. I regret missing out on Angel Falls, beautiful jungle, light trekking, nice canoe ride and many opt to fly over the falls in a Cessna for an extra $50. The vast plains of Los Llanos is cowboy country (well cowboys wearing boardshorts and peak caps) and the place to see wildlife in Venezuela, caimans, capybaras, piranhas, birds and it is famous for anacondas. Many tour offices in Ciudad Bolivar guaranteed us to see anacondas, this is not cool since I suppose they have an anaconda lying somewhere that the guide pulls out and you can stroke. The best price we could find in Ciudad Bolivar was B35 000 ($50) for a 3 day tour. Unfortunately we were very low on cash at this stage and I will have to pay 5 times as much for a similar experience else ware in South America. Every other night over Lake Maracaibo, a chemical reaction occurs between the mangrove water and the air to create silent lightning storms, called Catatumbo lightning. We did not go here, but go and look on google image, the lake is close to Merida and it looks amazing! these sandy Caribbean islands is the top place to go in Venezuela for amazing beaches, island hopping, good diving and snorkeling. Unfortunately it sounded very pricey and we decided to give it a miss. 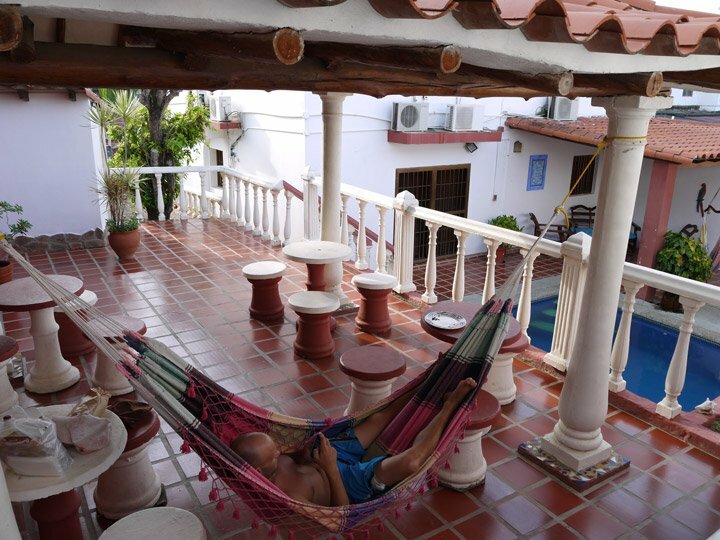 Some fellow travelers spent quite a lot of time in Merida, renting an apartment here and could not stop raving about the place. They spoke about an amazing student, party town with many surrounding hikes and it is a great place to go to do adventure activities e.g. cannoning, canopy, paintball, mountains, skydiving and paragliding. Would I go again? We are seriously considering another trip, we are currently in the south of Chile and so it is a long way back. This time we would take enough cash with us to do some tours. The opposition recently won parliamentary elections with an overwhelming majority if this would curb the chronic shortages, steep inflation and violent crime remains to be seen, the currency still seems to be in free fall with the current exchange rate to the dollar being 900:1. If you enjoy traveling in beautiful, cheap, exciting countries are a little bit streetwise and enjoy challenging and interesting places with few package tourists you should have a great time in Venezuela. Thank you for this nice and wonderful post. I must use this guide when i visit Venezuela. i have a good idea about venezuela from you. Thank again and i hope you regularly post this related topic. Thanks for the great article guys! I am planning on visiting Venezuela via Brazil and was wondering for an American how you think getting a visa at the border would be. Thanks! Hello Brian, thanks for reading. Unfortunately US citizens can not get them on the border.This is from an NBAA website – U.S. citizens traveling to Venezuela for tourism purposes must appear in person at the Venezuelan consulate closest to their residence. They must undergo a personal interview with Venezuelan consulate personnel and provide considerable documentation regarding their travel plans and intention to return to the U.S. Processing time will vary from one consulate to another. Hoe do you find money exchanges that change on the black market prices? Hi Larry, thanks for reading. You can find the official exchange rate on xe.com I do not know what the current blackmarket rate is, you might find it by searching on the internet. You can exchange on the street or at some hotels for black market rates. Just ask around when you arrive. You should be able to find out what a good exchange rate is this way. I am seriously considering visiting in the summertime however I will be alone. I was wondering how many solo travellers you met in Venezuela? If you met a few I would go, however I am unsure for my safety of i travel there alone (I am a 20 year old female from the UK and I’ve travelled mainly around central America and the Caribbean). I speak basic Spanish however I look Latin lol so I don’t really stand out. Also I travelled Honduras solo for a month when others told me I would be murdered and I met the most amazing people and had an amazing time! Hi Indi, thanks for reading! We met some solo travelers, not many. Michelle’s guesthouse in Santa Elena was a good place to meet people, we met an Irish guy, a British guy (both with very basic Spanish) and a British girl (fluent Spanish and looking quite Latino) here, all traveling on their own. 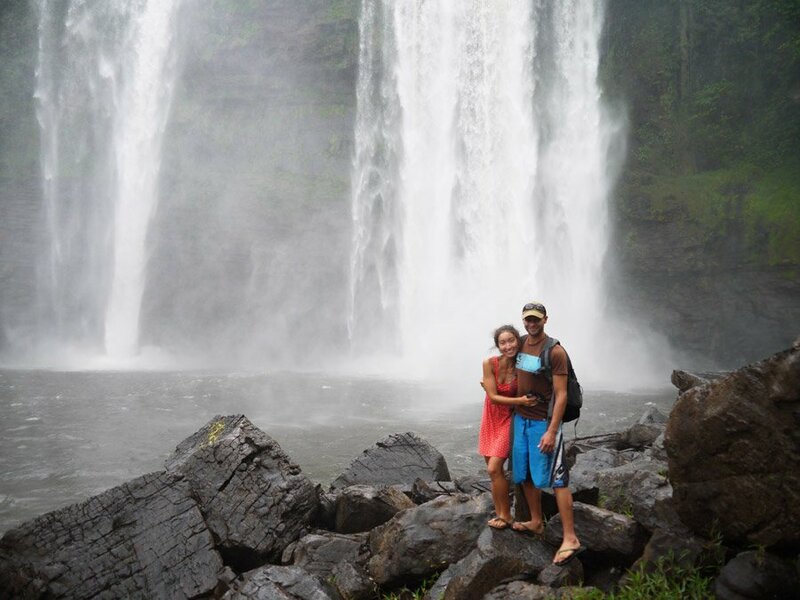 A Check couple we became friends with (they don’t look Latino at all) did a lot of couchsurfing all over Venezuela, you can find them on Facebook as HaHa Around the World they both could communicate in Spanish. 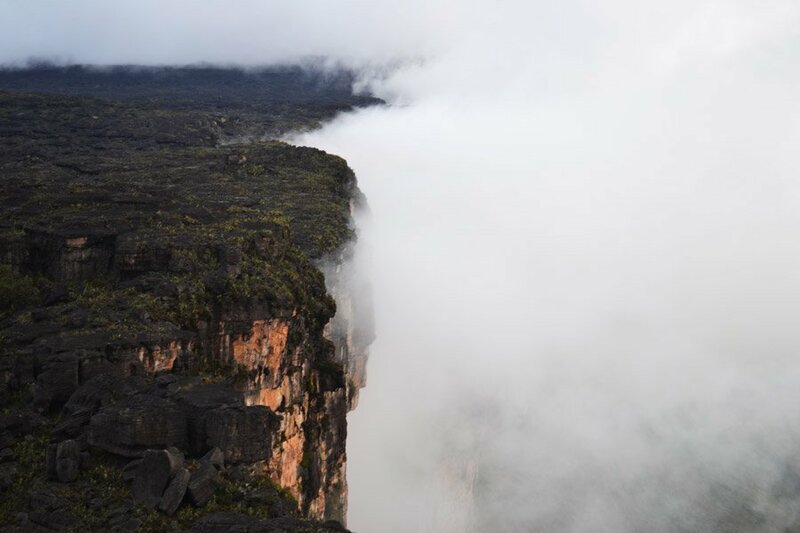 Most tourists come to Santa Elena de Uairen and stay around there you can do Roraima hike, Gran Sabana tour (waterfalls) and Angel’s fall from there. I love your post and am reading it Bit by bit. I’m planning to go to South America and Central America at the end of the year! You say that you regret not taking all of your money with you when you went to Venezuela, so I was wondering where you left your money? Did you take credit cards or just cash? Hi, when exactly did you visit venezuela? Because i think that situtation got a lot worse in may or april. Hello Vasilis, this entry was published about 6 months ago, we were there a year ago. I couldn’t help crying while reading this… My country is so damn beautiful yet so destroyed. I loved the post, and I am at your service whenever you want to come back! I am from India. Would like to know if I can find a local guide to travel around in Venezuela. I will stay there for a week in December, 2018 first week.